Latest interesting guest post by Ken Finnegan Technology consultant and advisor to the IDA for Irish Tech News. See more by him here. Image from pixabay here. At the beginning of April 2017 the European Commission held the first ever European Conference on Connected & Automated Driving (CAD). The aim of the conference was to inform, educate, discuss and familiarise attendees, at the oversubscribed event, about next generation transportation and vehicle connectivity. The European Commission expect to see full autonomy by 2040! What does this mean? Fully autonomous vehicles mean humans will no longer need to drive cars, trucks, vans, and taxis etc. aka. Driverless vehicles. Does this mean Knight Rider styled self-driving cars for the masses? (For those of you under a certain age Google Knight Rider). The vision for transportation of the future is unrecognisable compared to what is currently on our streets and highways. For regular road users driving cars will be a thing of the past. It is predicted that cars will simply take instruction from their owners in relation to where they want to go, the owner/passenger will simply sit into the vehicle, take out their Sudoku puzzle, social media chat, work or whatever distractions they prefer and say ‘take me to shopping centre but stop at the flower shop and if time I’d like to call into see my mother on the way back’. To achieve this vision a complex and sophisticated mix of technologies, policies, regulations, industries and more need to come together. At the Brussels event that is exactly what happened. Commissioner Violeta Bulc (European Commissioner for Transport) wanted to show how ‘big projects’ can benefit Europeans and she presented connected mobility. In October 2016 the Declaration of Amsterdam was signed by all 29 countries in recognition of connected mobility, the collaborative opportunities for member states with the aim to achieve cooperation in the field of connected and automated driving across Europe. So why are Connected Autonomous Vehicles so important to Europe, the commissioner and beyond? 1. The biggest priority is to save lives. There are 70 deaths a day on European roads. This is 26,000 per annum. A high percentage of these deaths occur because of human error. When you take the human out of the loop the vehicle and the vast array of sensors, infrastructure and data will prevent many of these deaths from happening. 2. The second priority is the fact that congestion costs approximately €1 billion a day. By removing traffic jams and inefficiencies on the street and highways there will be an economic gain and also a better quality of life for road users. 3. Thirdly, even if vehicles are still powered using combustion engines, there will be a positive environmental impact through the more efficient use of vehicles and infrastructure. However it is envisioned that more and more vehicles will be electric thus adding substantially to a greener environmental impact. To achieve success the industry has created an incremental scale or roadmap, no pun intended, in achieving fully autonomous vehicles. This scale starts at zero, where zero represents no automation, your traditional manual vehicle, and 5 represents fully automated driverless vehicles. See scale and description below. 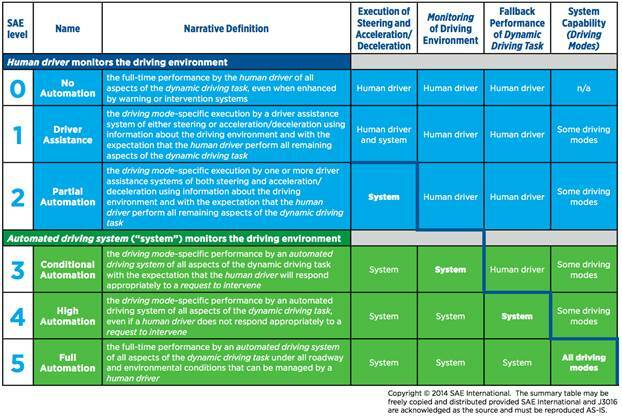 Image result for SAE Levels Autonomous Vehicle level scale. Examining the scale it is obvious to many new car owners that we have begun the journey to autonomous vehicles. Today many new cars are equipped with driver assist such as cruise control and self-parking capabilities. These are levels 1 and 2 in the above scale. If you are lucky enough to own a Tesla even level 3, conditional automation is available, where the driver can take their hands off the steering wheel and let the car take control. In order to run we need to walk first and as technology and innovation progress so too does the evolution to full self-driving cars. This is inevitable. There were presentations and panel discussions from government representatives about projects that are happening in their countries, technical discussions and workshops from the automotive industry, policy considerations from policy folks and government representatives, regulatory conversations, data privacy and protection, legal implications, technology company representatives demonstrating the new technologies needed to achieve the vision and a lot more. “In order to achieve this Europe must collaborate” Bulc said. Collaboration is essential. For a fully connected and autonomous vehicle to be realised many industries need to work together (not to mention government policy, legal, regulation etc). A connected vehicle will require many technologies that car manufactures don’t provide. According to Deutsche Telecom, it’s not only vehicles that will need to be connected but also pedestrians and cyclists. Vehicles will need to be able to communicate with other vehicles (Vehicle to Vehicle: V2V communications) and also with the streets and other infrastructure like sing posts, bridges, footpaths (Vehicle to Infrastructure: V2I Communications) in order to navigate safely. To achieve this vehicle manufactures and teleco’s will need to work together (just from a tech perspective). Latency is the most important issues for them – Latency is the amount of time it takes a message to be delivered and understood by the compute parts of the infrastructure. Cyber Security was topic de jour. Terminology that we are familiar with today from the software and security industries were discusses such as ‘security by design’ which means that security for vehicles is not an additional add on at a later stage but all aspects of security must be considered and designed into the vehicle through all stages of the design and development process. A public consultation and forum about security would be required according to one panel member from Eindhoven University. A massive 5gb of data will be generated every hour by a full autonomous vehicle. Volvo insists that all data generated by a vehicle will be owned by the driver in their vehicles. · By 2040 mostly driverless cars. · Unexpected uses for vehicles – we don’t know what is going to happen. · Hugh potential with freight transport and self-driving taxis. What is Ireland doing in this space? This is a really interesting question, because when you talk about the connected vehicle, first and foremost you think about the vehicle. However with self-driving cars, technology is of primary importance. With our rich heritage in technology – sensors, software, augmented reality, machine learning and telecoms we can see opportunities specifically with the vehicle but we must also look beyond the car and ask questions like – what type of platforms will connected vehicles need? How is the data managed and governed? 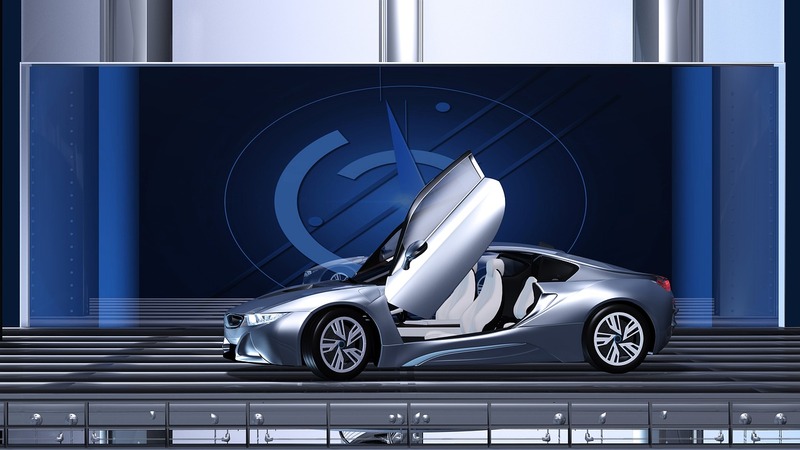 Should Ireland become the global centre of excellence for automotive data analytics? What about the social issues? Is education and training up to scratch? What are the unique advantages Ireland has to offer and how can we succeed? IDA Ireland, Enterprise Ireland, Science Foundation Ireland, Intelligent Transport Ireland and the department of transport established a working group with the aim of putting Ireland firmly in the centre of activity for Connected and Automated Vehicles. The group was formed earlier this year with the aim to define and set out a vision for Ireland in this space. Over the past few months there has been much activity with the group in terms of understanding Ireland value proposition and capability as well as identifying opportunities. We have invited thought leaders, representatives from academia, industry and government to participate in a design thinking workshop to really understand where we currently are but more importantly what our strategy is going forward. We intend to define our vision for Connected and Automated Vehicles and present a unified message to world about why Ireland for Autonomous Vehicles. Ireland, small enough to trial, large enough to prove.